Nowruz; Iranian/Persian New Year, to welcome the first day of spring. 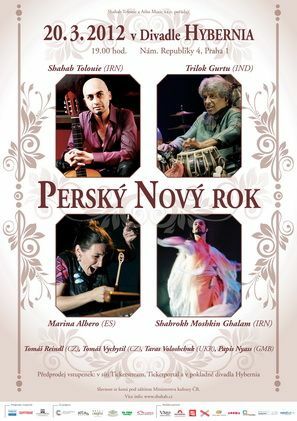 At the Hybernia Theatre, on March 20th 2012 at 19:00, the holiday of Nowruz will, due to popular demand, be celebrated for the third time in Prague and České Budějovice in a festival of music and dance. Persian guitarist and singer Shahab Tolouie will be joined by distinguished international guests; Grammy award winner and multi-percussionist Trilok Gurtu from India, Persian Dancer Shahrokh Moshkin Ghalam, and Marina Albero from Spain on Persian instrument Santur. Celebrations will kick off as early as March 15 with press conference announcements, followed by an exhibition of the paintings of notable Armenian painter Edward Edigaryan. Also on March 20 at 19:30 the Hibernia Theatre will be filled with the impressive combination of Persian, Spanish and Indian cultures. In previous years, most guest performers have been Czech personalities (Radim Hladik, David Koller, Jiři Srnec and Pavel J.Ryba). This year’s guest list is an international one. Indian percussionist Trilok Gurtu is known for collaborative projects with such jazz luminaries as Oregon, John McLaughlin, Joe Zawinul, Pat Metheny and Jan Garbarek. Also present will be intensely expressive Iranian dancer Shahrokh Moshkin Ghalam and Marina Albero, Spanish santur player. Marina Albero also works with the well-known Spanish jazz pianist Chano Domínguez. Nowruz is officially recognized and registered on the UNESCO List of the Intangible Cultural Heritage of Humanity. More than 300 million people in Iran, Afghanistan, Albania, Georgia, Kazakhstan, Kyrgyzstan and other countries celebrate this day on first day of spring. Preparations start about one month in advance. Interestingly, some traditional observances are similar to Czech Easter traditions; E.g., “spring cleaning”. All Iranians buy new clothes for the new season celebrations. The dining table is decorated with green fresh-grown wheat and colorful painted eggs similar to our Eastern traditions to symbolize light, warmth, life, love, joy and well-being within nature. Nowruz pays great homage to mother nature. Tickets: Ticketportal, Ticketstream, Theatre Hybernia box office. 10% discounts for students with ISIC cards, pensioners and the disabled in the Hybernia box office.